Every kid loves playing with water. Especially during the hot weather, it is good to allow your kids to have this fun. If you are not able to invest in a pool or something more expensive for your backyard, then you can keep your baby entertained with the best kid sprinkler. These sprinkler toys are not only inexpensive; they are also very easy to use. All you have to do is hooked the sprinkler to your outdoor garden hose and you are ready to go. Kids can play different games through the spraying water that will give them a sense of happiness and keep them busy in this summer. Here I reviewed the top 10 best water sprinklers for kids in today’s market that will help you to choose the right one for your backyard. How Do You Identify The Best Kid Sprinkler? The Melissa & Doug Sunny Patch Blossom is a perfect kids sprinkler for your backyard. It’s made out of a soft, slightly bendable rubber. It can attach easily to any ordinary garden hose. It will entertain your baby by spraying cool water. The water will come up out of the flower blossoms on the top of the toy. The flowers are rigid enough to stay still while the water is flowing out of them. If you can’t get the spray higher than 2 feet in the air, I’ve brainstormed a solution for that. All you have to do is hook only one long hose directly into the spigot. And BAM! You can get the water spray almost 5-6 feet high! I would recommend this product to anyone who has a small baby between the ages of 3 to 4 years, but if you have a kid over the age of 5, then this sprinkler may not be exciting enough for him. Because it is not overpowering and won’t spray water all over the places, so your kid might be fell boring to play with it. The sprinkler made of a durable material. Sprinklers feature Sunny Patch Friends. Easy to connect with any garden hose. It may not be perfect for larger kids to enjoy with the spray. Fire Hydrant Garden Hose is another great sprinkler for kids. It’s easy to set up and can be connected with any garden hose. It’s very small in size just 8 inches tall but incredibly powerful. So much so that it can water your entire lawn as well. It can splash water up to 8 Feet high in the air. It also spins and sprays the water all over the places, so your kids can just stay in one place near it and get drenched or trying to run and avoid the water for more fun. Moreover, this is one of the sturdiest and steadiest sprinklers on this list as well. It is super easy to set up. The base is well-built. Therefore, you don’t have to stake it into the ground to prevent it off tipping over. Keep in mind, if you have a good water pressure then this fire hydrant water sprinkler will perform more better. Perfect for 2 to 4 years baby. It’s easy to store when not in use. Spins and sprays water everywhere. Its color may fade away after a long exposure to the sunlight. This is a Perfect little pool for your little kids. The ring around the outside had small holes where the water comes up. The bottom fills up like a tiny swimming pool maybe 2 or 3 inches deep. 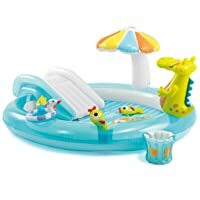 It allows your kids to play with their water toys in the circle of the pool. I would recommend water shoes or sandals for the little babies as it can become slippery. You can also adjust the height of the water since it’s hooked up to the hose continuously. For babies and younger toddlers, you can easily keep the sprinklers pretty low. Coming to the quality of construction, the novelty of design and durability are really worth praising. The pool doesn’t require to be inflated. You turn on the faucet and it fills up with water. Although the pool is only a few inches deep, little kids can enjoy a gala time by splashing water on each other in it. I would recommend this product to anyone with a young baby (1-3 years) who likes to play with water. Kids can play in the circle of the mat. Easy to hook up the hose. You can adjust the height of the water fast or slow. Getting the water out of the mat is much easier. Meet with another great sprinkler on our list Melisa &Doug. This sprinkler is easy to set up and can be attached to any standard garden hose. The worms are soft plastic so you don’t have to worry about your kid’s feet if they are accidentally stepped on it or falls on them. Some parents, especially those of small babies, will appreciate the fact that the rubber worms don’t move or wiggle. This makes it safer for babies as they don’t have to face a sudden blast of water from an unpredictable direction every time. It has the right amount of water spray that is perfect for young kids play. It shoots water out of each of the worms over a few feet high in the air and sprays the water everywhere for a cool and fun time. The water can spray as low or high depending on the force of your water pressure. It is easy to hook up and take off. Little worms are made of soft plastic that is safe for the kids. The sprinkler is not large enough for the older kids. Your kids will love to play with this sprinkler because it’s designed with children in mind. This one is best for toddlers and grown-up babies who can enjoy wild whirly streams without getting themselves hurt. 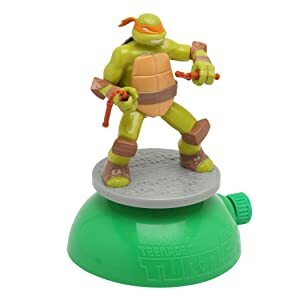 The sprinkler is very easy to use, simply attach the garden hose with the nozzle of this sprinkler, the inflatable Michelangelo will move his arms in several directions – think crazy ninja moves and jet out water from 4 different points. And because of this multi-direction water shooting feature, it can water the plants in your garden as well. Familiar character for the kid. Easy to attach any garden hose. High water pressure necessary to get good sprays. 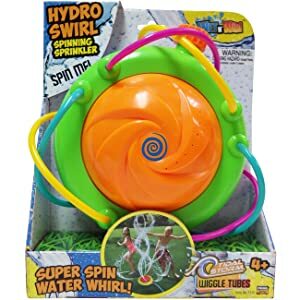 Tidal Storm Hydro Swirl Spinning Sprinkler will be an ideal choice for who want to entertain many kids at once. It is very easy to install, just connect to your garden hose and your kids can playing right away. This colorful sprinkler is a blast with hydro powered spinning dome and 6 wiggle tubes. The center spinning spray shoots water up at least 15 feet and the radius of the spray from the wiggling tubes is also roughly 15 feet. The durability of this sprinkler is certainly worth extra brownie points. If you have a mischievous pet in your house that is very likely to toss it over, bite it and jump on it, Tidal Storm Hydro could be the best option for you. Spray water goes everywhere, just not straight up. The spray tubes are strong and quite tall. If you have not high water pressure then the sprinkler will not spin from the center. This ball is great. It is colorful, sturdy and a great size for all ages baby. You can also attach the ball to any garden hose. As the ball is big in size at 88 inches so more than one baby can play with this. Your baby can also play with it when there is no water hooked to it at all. They can jump on it and roll around on it. I would strongly advise you to use an air compressor to inflate the ball. Doing it the regular way can take a long time. Depending on the water pressure it can spray water all over the places. So your baby will get more fun at their playtime.The massive ball is certainly built to last. No matter whether you put it on grass surface or trampoline, irrespective of how much abuse you put it through- it will hold up well. This ball is also received “the parent’s choice award” by Parents’ Choice Foundation that proves it is an awesome summer toy for every kid. This sprinkler toy would be suitable for younger kids as well as older. Children can jump and roll the ball for more fun. Easy to attach the ball to any garden hose. Need high pressure for spray water in all directions. 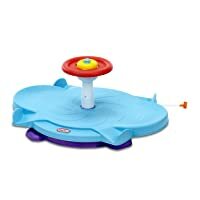 It is an extremely safe and yet fun toy for small kids who get a bit scared by high water streams. You can easily lower the stream using the faucet. As your children grow, turn on the hose in full blast and enjoy! In most cases, it needs high pressure to properly balance the ball on top. However, as long as you learn how to fiddle with the water pressure, you can balance the ball with low water pressure as well. The sprinkler comes with 4 plastic balls. The spiral part of the sprinkler has such a powerful jet stream that it shoots the water and the ball high in the air.Your baby will love to play with it; they can play a game to catch these balls even as they play with water. Features plastic footed garden spike is already molded onto the Super Spiral that means it will stay upright even with strong water pressure. Kids of all ages can play with this toy. Comes with 4 plastic balls for more fun. Can be used in everywhere. Need high water pressure in order to have the ball actually balance on top of the water. Get ready for big fun with this giant whale water sprinkler toy. This incredible sprinkler toy will engage your kids in exciting outdoor games and cool water activities in your own backyard and garden. It is very easy to set up in just 3 simple steps, All you have to do is hocked the sprinkler toy to a garden hose, let it inflate by itself and you are ready to go. This 2 in 1 sprinkler toy can be float into the swimming pool with your kids. 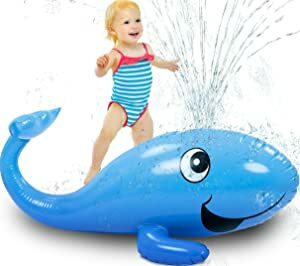 You have to just simply fill the whale with air and keep your kids entertained outside all summer long. The best part is that the whale remains inflated for days and even weeks if you want to keep it that way. There’s a water-weighted sprinkler base that ensures excellent stability and balance that making this sprinkler totally safe for younger baby. So you can keep your mind at peace that your children will enjoy a safe and carefree play at all the times. Can be used as a pool float or a beach toy. Perfect for young kids (18 months and up). Soft & stable for safe play. Relatively small number of spray outlets that’s means it will not be enjoyable for older kids to play. This is a marvelous water sprinkler that is perfect for toddlers as well as sprinkling plants. It is very small in size but works great with its 30×30 feet water spraying range and 362-degree circle spray pattern. The sprinkler spraying gentle amount of water that won’t scare your little one, but it is powerful enough to go 7 0r 8 feet high in the air. 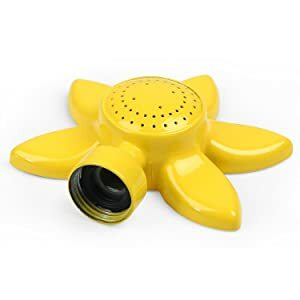 Moreover, the plants in your lawn will also love the slow, breezy water spray from this sunflower-shaped sprinkler. If you wish to cover a large area of your lawn, be sure to turn the hose on full blast. It’s also made of aluminum with a powder-coated paint which means it will last a long life without any rust. You can adjust the water pressure for higher or lower fountain. Can be attached to any garden hose. As you can see, the sprinkler is very small in size so it may be not suitable for your bigger kids. The Little Tikes can transform your home into an amusement park. It’s the best sprinkler toys for hyperactive kids. Whether you have one or two kids, they can sit on it, spin and go crazy. While most people use it indoor, you can always attach a hose to it and let them play outside. It’s a total fun booster for your kids. I wish I could become a kid again, because the Spill & Splash makes me remind what I missed in my childhood. But your kids won’t miss the fun. 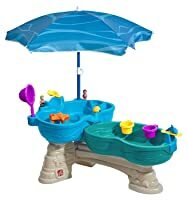 This outdoor toy will enrich their creativity and let them get a feel of underwater adventure. 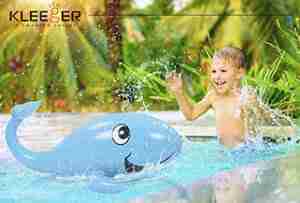 With lots of cool stuffs like flipper and water spinner, it will bring joy in your family. Give your kids the perfect pirate adventure experience with Little Tikes Anchors. Water, canons and anchors, what more do they need for a little fun. 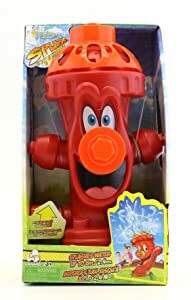 Personally, I think it’s the best sprinkler toy for your kids’ mental development and leadership. It replicates a whole crew ship that your kids will love instantly. Boom boom! 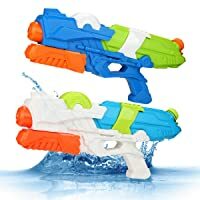 Team up your kids and let them battle with Young Choi’s water guns. 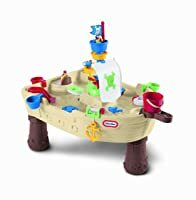 With easy to fill water features, this toy is perfect for making your kids learn team cooperation. It’s an awesome toy for having fun with water and strategy building. Let them make a team and beat one another. Talking about cute toys, I can imagine only about Intex Gator. Toddlers just love interacting with the alligator that sprays water. For warm summer days, your kids will remain cool playing and sliding in it. If you have trouble getting your kids to bath, let them take the Gator outside. Some kids even beg to play in the pool, how awesome it is. Design and color: It is one of the most important things that you should keep in mind while buying a kid sprinkler. As we know bright colors always attract the kids, so if you choose the design of the product charming and bright then it will catch the eyes of the kids and they will enjoy to playing with it. Adjustable water height: Some sprinkler gives you the opportunity to adjust the height of the sprinkler with your hose. So you can simply keep the pressure of water high for the older baby or can be adjusted a small amount of water for younger toddlers. Maximum spray capacity: If you have an older baby then you should choose a sprinkler that sprays the water all over the places. It will add more fun and pleasure to kid’s entertainment. Playing with water outdoors or indoors can call for minor risks. Some of these can help you maintain safety for your kids. If your kids play outdoor there’s a good chance they might get heat burns from the sun. Applying Sunscreen can be a good option but that can wash away easily with water. Place them near a shed or get a large umbrella. You might have toddlers and a little older ones. Sprinkler toys for older kids might have a higher water pressure and design not suited for toddlers. The best water Sprinkler for kids will let you control the water pressure and often specifies the appropriate age criteria accurately. Water either too cool or too warm can be bad for your toddlers. Although, I hardly found any issues with this. But depending on where you live, the water temperature can vary. So, a little precaution can save you hundreds of dollars on medicines. The place where your kids play with the sprinkler will remain wet. You should be careful to see if they are slipping or not. The risk is more when it’s indoor as you might have a smooth floor. For avoiding slip and fall, placing on grassy outdoor spot is useful. Playing in the water is important in children’s development. It provides physical, mental and social benefits that children may need in the future. Here I discuss some important benefit of the water sprinkler. Keep kid active: When kids playing with the sprinkler they try to catch water being spewed out of the nozzles and jumping for joy all these activities help to keep kid active all day. Communication skill: Kids are always excited to share their discoveries and experience with everybody. This excitement will be a confidence booster for kids in the future. Language development: Kids get to learn some words related to water play as funnels, moisture, nozzles, hocked which will Increase their vocabulary. Social development: Water play allows baby to practice sharing and working together with everyone. Motivate kids to play outside: Sprinkler toys will motivate your kids to play outside instead of watching TV or playing computer games all day. Resources: Benefit & safety tips of water play for children. These are the best kid sprinkler in today’s market. All of these products are outstanding and offer fun to all ages kids. So take your time to plan and decide what type of sprinkler that your kid really needs. We believed that Melissa & Doug Sunny Patch Grub Scouts Sprinkler is the perfect sprinkler for younger kids in today’s market. It comes with a soft, slightly bendable rubber so if your kid falls on it they should not get hurt. They are easy to use and can be attached to any ordinary garden hose. The material is also durable. 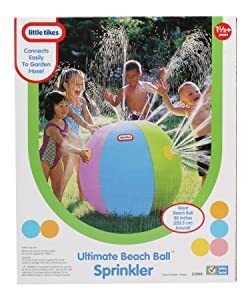 For bigger kids, we hope Little tikes beach ball sprinkler will be the best choice. 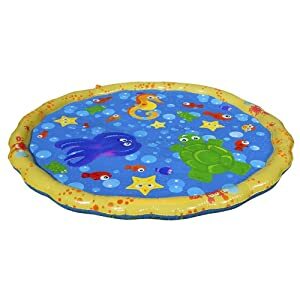 It shoots out a great amount of water and reaches very far that will provides plenty of entertainment for older kids. The spray is not to hard and it can be adjusted to high or low. You can go with any of the sprinklers that we mentioned above and ensure your kid’s enjoyment of this summer.